“Something big is happening in Letterkenny this summer and we want to make sure you know about it: DruidShakespeare tours to An Grianán from 3rd – 6th June. The production is not only one of our most ambitious undertakings ever, it also marks our fortieth year making theatre! Above: Marty Rea who appeared in DruidMurphy at An Grianán (photo by Catherine Ashmore) plays Richard II in DruidShakespeare (photo by Matthew Thompson). “Druid has toured the length and breadth of the country, and all over the world. Our relationship with Donegal goes back to 1983 when we brought M.J. Molloy’s Wood of the Whispering to Ballyshannon and Ballybofey. Over the next twenty years we performed regularly throughout the county, from Buncrana to Aranmore, and in recent years, An Grianán Theatre in Letterkenny has provided us with a home away from home. In 2013 we staged DruidMurphy – Plays by Tom Murphy at An Grianán, and now DruidShakespeare heads north to celebrate the mastery of the bard in our fortieth year. “Mark O’Rowe, one of Ireland’s most exciting writers, has condensed four Shakespeare plays – Richard II, Henry IV (Pts. 1 & 2) and Henry V – in this new action-packed adaptation for Druid. 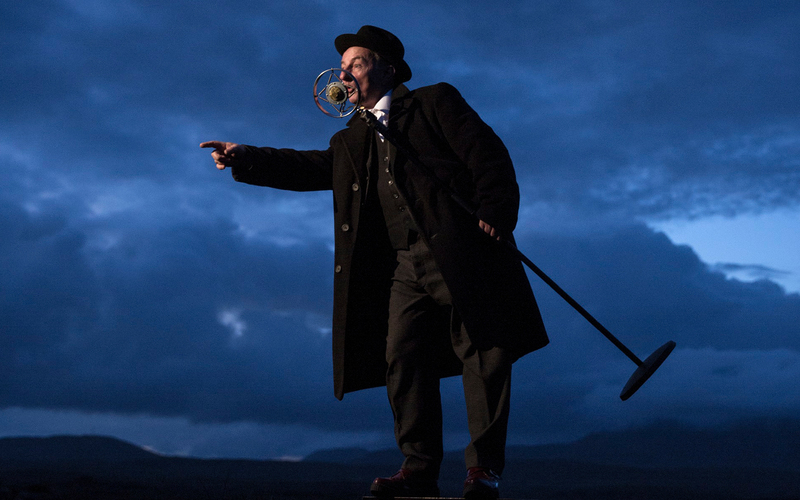 The production features an exceptional cast, including some of Ireland’s most acclaimed actors: Clare Barrett, Derbhle Crotty, Gavin Drea, Bosco Hogan, Garrett Lombard, Karen McCartney, Charlotte McCurry, Aaron Monaghan, Marie Mullen, Rory Nolan, John Olohan, Aisling O’Sullivan and Marty Rea. You can expect singing, thrilling dramatic moments and a rousing parade of characters including one of Shakespeare’s greatest comic creations, Falstaff. View all news for DruidShakespeare. 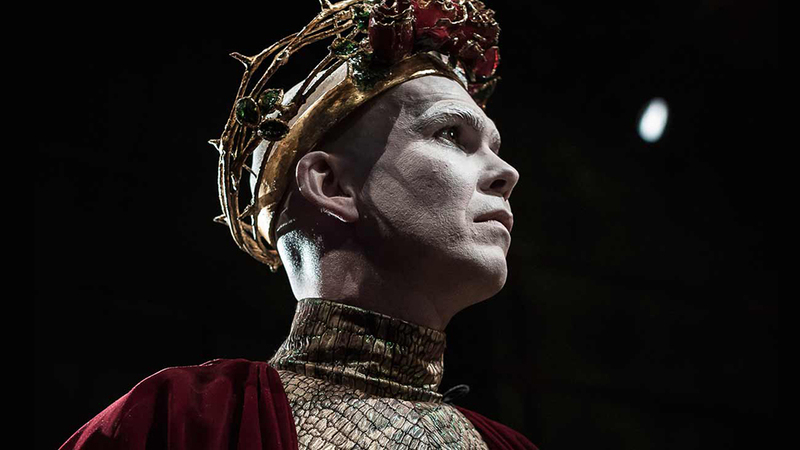 DruidShakespeare is an epic theatre event that condenses four action-packed plays – Richard II, Henry IV (Parts 1 & 2), and Henry V – into one thrilling drama played out over six hours. It had its official opening last Saturday night in the Mick Lally Theatre and here’s a little sample of what audiences have been saying about it. A feast of Kings. . . #DruidShakespeare @garryhynes . . . Ballagh woman strikes again. Sensational. @CraigFlaherty @garryhynes many many thanks to you and all the team for that #DruidShakespeare experience. DruidShakespeare comes to An Grianán Theatre this June. Buy tickets now or find out more about the production here. Check out these behind the scenes images from Druid Theatre as they continue rehearsals for their epic DruidShakespeare project which they will tour to Donegal this June. DruidShakespeare condenses four action-packed plays into one thrilling drama with an exceptional cast, live music and a rousing parade of characters including one of Shakespeare’s greatest comic creations, Falstaff. You can find out more about the production here. As announced at the official Druid press launch on Friday we are thrilled to be one of the venues that DruidShakepeare will visit on their Irish and American tour. Druid are describing this project as their “most ambitious ever undertaking” and it is a fitting marker for the company’s fortieth year making theatre. With an ensemble cast of thirteen actors, this major new theatre event will tour to Letterkenny, Sligo, Castlebar, Limerick, Skibereen, New York and Kilkenny over the summer months. DruidShakespeare is an exploration of English history through an Irish lens. As Shakespeare was writing Richard II, Henry IV (Pts. 1 & 2), and Henry V, English forces were being sent to Ireland to quell rebellions and these expeditions are referred to throughout the plays. Adapted by one of Ireland’s most exciting writers, Mark O’Rowe, DruidShakespeare distills the narratives of these four works into a unified dramatic action. Shakespeare’s language has been preserved as has the chronology of the plays but O’Rowe’s adaptation removes ancillary characters and streamlines the narrative to harness the drama of these epic works. The ensemble cast features many familiar faces to our patrons who have attended previous Druid productions at An Grianán.